A phrase used during fitness training, ‘Time Under Tension’ refers to how long a muscle is under strain during a set – referencing the stress through the mounting pain that the muscles endure to strengthen and lengthen. 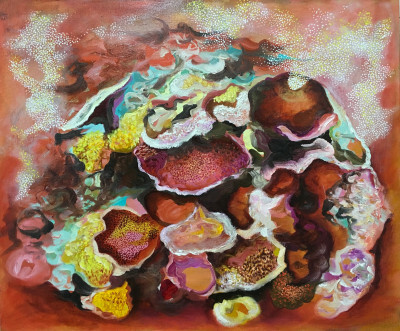 Lynn Parotti’s exhibition of the same name uses this phrase to bring to light the constant pressure that coral reefs endure as a result of the compounding impact of our human footprint and subsequent effects of global warming. The metaphor continues as ‘time’ is of paramount importance to the warming seas’ effect on coral. This new series of paintings titled ‘Bahama Land’ depicts Bahamian reefs in full, exuberant color: images of a landscape that will almost certainly be lost. Created during a time when news headlines read “Major Climate Report Describes a Strong risk of Crisis as early as 2040” (7th October 2018, NY Times), Parotti’s paintings give reason to take action and protect the environment around us. Coral bleaching results in no habitat for fish and sealife, leading to no food for sustenance living in poorer communities and the eventual destruction of the food chain. Parotti’s thick and descriptive application of oil paint depicts how it might feel to be in the ocean witnessing the distortion of the reef’s form through a series of expressive and compelling brush-marks. These alluring paintings offer spaces that envelop the viewer, affronting us with the pain of losing the crucial importance of our reefs first hand. Lynn Parotti’s TIME UNDER TENSION is an ode to the Bahamian seascape and stresses the need for environmental conservation and action on carbon emissions. Like her former series Tar Baby, Territory, Slick and Green Fuse, this new work, Bahama Land is heavy with warnings of a disappearing part of our home, ultimately encouraging reverence for a space filled with nostalgia, beauty and erosion. A follow up exhibition, 2 DEGREES C, is scheduled for Volta NY, The Current: Baha Mar Gallery and Art Center, Booth B12, Pier 90 – Berths 3& 4 in New York (March 6-10, 2019). Parotti’s work is currently included in two touring group exhibitions: Relational Undercurrents: Contemporary Art of the Caribbean Archipelago curated by Tatiana Flores and exhibited at the Museum of Latin American Art in California, and subsequently at the Wallach Art Gallery in New York and the Patricia and Phillip Frost Art Museum in Miami (2017-18); and in Arrivants: Art and Migration in the Anglophone Caribbean World, curated by Veerle Poupeye and Allison Thompson at the Barbados Museum 2018-19).